This Sunday, June 8, marks the 30th Anniversary of the 1984 classic Ghostbusters debuting in theaters, and Sony Pictures is celebrating by bringing director Ivan Reitman's paranormal comedy back to theaters this summer. The studio is also releasing a new Blu-ray set including the 30th Anniversary Edition of Ghostbusters and the 25th Anniversary Edition of the 1989 sequel, Ghostbusters 2, marking its first time ever on Blu-ray. Take a look at the packaging artwork for this new set, arriving in retailers September 16, then read on for more information. A newly restored and remastered version of Ghostbusters will arrive in over 700 theaters across the country on August 29. The theatrical presentation is the centerpiece of Sony's anniversary celebration, which also includes special events, new merchandise and the aforementioned Blu-ray set, which will include new conversations with director Ivan Reitman and Dan Aykroyd, along with deleted scenes from Ghostbusters 2. Here's what Sony Pictures' worldwide distribution president Rory Bruer had to say about the hit franchise in a statement. "Ghostbusters is still one of our studio's most beloved franchises. I was lucky enough to work on the release of the film on its first run, so it's a real thrill for me to see that it's still connecting with audiences everywhere. On the big screen or in home entertainment, this is a great movie to experience again and again." Fans can also CLICK HERE to visit the new Ghostbusters website for more information. Sony Pictures has issued an official press release with more details on the special features that will be included on the Blu-ray set and much more. Commenting on the announcement, Rory Bruer, president, Worldwide Distribution for Sony Pictures, had this to say. "Ghostbusters is still one of our studio's most beloved franchises - I was lucky enough to work on the release of the film on its first run, so it's a real thrill for me to see that it's still connecting with audiences everywhere. On the big screen or in home entertainment, this is a great movie to experience again and again." Following the theatrical release of the film, on September 16, fans will be able to own the Ghostbusters 30th Anniversary Edition on Blu-ray and the Ghostbusters 2 25th Anniversary Edition, as that film makes its Blu-ray debut. 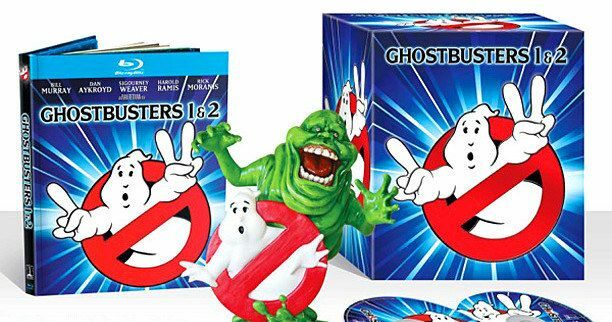 The Sony Pictures Home Entertainment releases of the films will also be available in a two-disc anniversary edition Blu-ray Digibook including both films, as well as a Limited Edition gift set that includes an exclusive collectible Slimer figurine and the two-disc Digibook. This special gift set will only be available for a very limited time, with the collectible Slimer figurine being a true must-have for fans. Both films have been fully restored and remastered in 4K and will be presented in high definition on Blu-ray from those 4K sources. Both the Ghostbusters and Ghostbusters 2 Blu-rays come loaded with exclusive bonus materials, including revealing conversations with Ivan Reitman and Dan Aykroyd, as well as never-before-seen deleted scenes from Ghostbusters 2 and more. The Ghostbusters anniversary edition features the original music video of the Oscar nominated song "Ghostbusters" by Ray Parker Jr., while Ghostbusters 2 includes the original music video for "On Our Own" by Bobby Brown. In addition, Ghostbusters will contain all previously released legacy content, commentary and an interactive Slimer Mode, offering fans a picture-in-picture graphical viewing experience. Lexine Wong, Senior Executive Vice President, Worldwide Marketing, Sony Pictures Home Entertainment, had this to say in her statement. "To celebrate this milestone anniversary, we wanted to create something new and collectible for fans. These new Ghostbusters Blu-rays will feature the highest quality presentation along with new content that reflects the rich history of this iconic franchise." Directed and produced by Ivan Reitman (Meatballs, Stripes), with the screenplay written by Dan Aykroyd (My Girl) and Harold Ramis (Knocked Up), Ghostbusters is listed as No. 28 on the AFI's List of America's Funniest Movies. Bill Murray (Stripes), Dan Aykroyd (The Blues Brothers), and Sigourney Weaver (Aliens) star, along with Harold Ramis (Groundhog Day), and Rick Moranis (Honey, I Shrunk the Kids). Ernie Hudson (TV's Oz) and Annie Potts (TV's Designing Women) also star in the films. Ghostbusters: University parapsychologists Dr. Peter Venkman (Murray), Dr. Raymond Stanz (Aykroyd) and Dr. Egon Spengler (Ramis) lose a research grant when their experiment methodology is proven to be bogus. The team decides to go into business for themselves and open Ghostbusters, a ghost removal service. After struggling to get on their feet, they are summoned to investigate the strange happenings in Dana Barrett's (Weaver) Central Park West apartment. What they discover is that all Manhattan is being besieged by ghosts and other worldly demons through a portal in her building. Ghostbusters 2: Supernatural superstars Peter Venkman (Murray), Dr. Raymond Stanz (Aykroyd) and Dr. Egon Spengler (Ramis) spring back into action when the infant son of Dana Barrett (Weaver) becomes the target of a powerful demonic force. Reunited with their industrious secretary Janine (Potts) and the nerdy, near-sighted Louis (Moranis), the 'heroes of the hereafter' must put a stop to an enormous underground river ready to rot the roots of the entire Big Apple. - NEW! Ghostbusters Music Video - Ray Parker Jr.
Ghostbusters has a run time of approximately 105 minutes and is rated PG. Ghostbusters 2 has a run time of approximately 108 minutes and is rated PG.